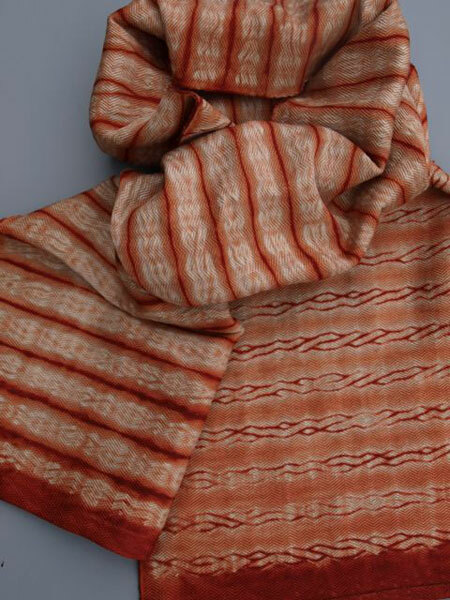 Woven shibori is the perfect medium to explore natural dyes, resists, and layering of colors. One doesn’t even have to weave on a loom in order to work with this technique if you are using the woven shibori “blanks” that are woven at The Oriole Mill in Hendersonville, NC. All the fabrics are made of high quality mercerized pima cotton, which dyes beautifully. 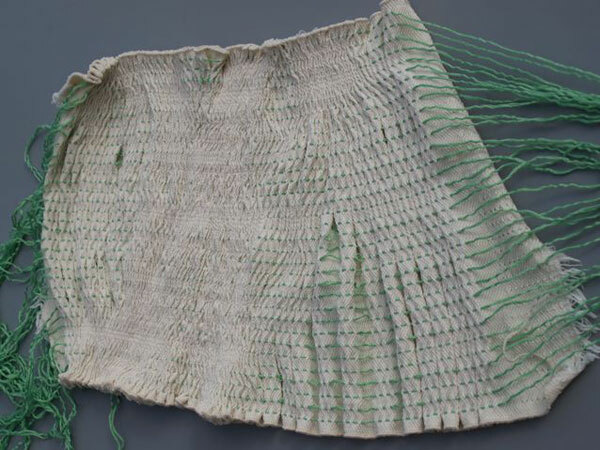 The pattern/gathering threads are supplemental to the ground cloth and are used to gather the fabric and make a resist for dye. Ultimately, the pattern threads will be removed from the cloth, leaving only their memory in the dyed pattern. a. Secure all loose gathering threads before any wet processing. 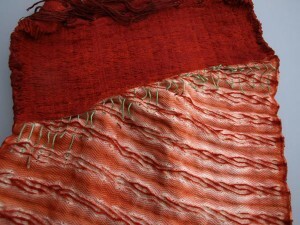 Tie pairs of threads together all along each edge using a small overhand knot without significantly gathering the cloth. This will prevent these threads from slipping out while you are scouring/mordanting the cloth. b. Scour the cloth completely by simmering for about 10 minutes in water with a few drops of Synthrapol™ or liquid Joy™ dish detergent. c. Briefly rinse the cloth and then squeeze out all excess moisture and immediately proceed to step 2. If you are using only indigo as a dye, you may now dry the cloth and skip to step #3 but all other dyes will need to have a mordant applied to the cloth in order to bind the dye to the fiber. a. Mix up a 5% solution of aluminum acetate (see specific amounts below). You will need just enough solution on which to immerse the damp cloth so that the mordant is evenly absorbed by the entire fabric. It will seem like a tight fit in a container but that’s OK. Submerge the cloth in the mordant and allow it to sit for about 10 minutes. Squeeze out any excess mordant back into the mordant container and dry on line or in a clothes dryer. The following amount will give you enough mordant solution to immerse your project. There will be plenty of mordant left! Consider mordanting other scoured cotton or silk fabrics until the mordant is totally used up so as not to waste anything. It can be stored for a few days if covered and refrigerated. -For a scarf: mix 50 grams aluminum acetate in 1000 ml cold water. -For a shawl: mix 75 grams aluminum acetate in 1500 ml. cold water. -For a set of 6 samples: mix 10 grams aluminum acetate in 200 ml cold water. Immerse one sample at a time. Once the fabric is COMPLETELY dry, the pattern threads may be gathered. 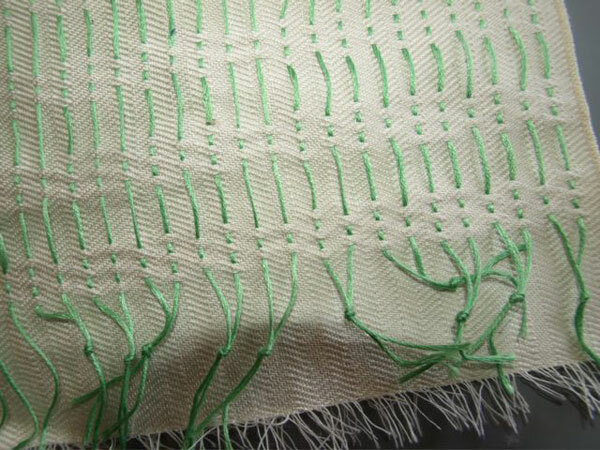 Carefully pleat the cloth by sliding groups of threads all the way down one side. You will be pulling against the overhand knots that you tied on the other edge. Then go back and gently, but firmly pull on each individual pattern thread . This will insure clear resists. You can also pull threads from both directions, just be sure to make a new set of overhand knots on one end. On the other end tie groups of 4 threads into square knots Trim the tails of the gathering threads no shorter than 2”. Cloth fully gathered, green threads tied. This step is to set the mordant on the cloth and wet out the cloth before dyeing. Make a fixing solution of 20 grams of chalk (calcium carbonate) and 2000 ml hot water. (double this for a shawl piece) Immerse the cloth in the fixing solution and allow to soak for at least one hour. The cloth must be wet all the way inside the pleats in order to get a good resist for the shibori. Rinse briefly and proceed to Step #5, dyeing. *fixing is not necessary if you are only dyeing with indigo. Just wet out in hot water without the chalk. If you have a gram scale you may determine your dye amount by weight. Based on the weight of dry fiber, weigh out madder extract at 10% the weight of your fiber. This will give you a saturated color to display the resists. If you don’t have a grams scale, use the chart below to determine dye extract amounts. Dissolve the extract completely in about 1 cup of cold water. 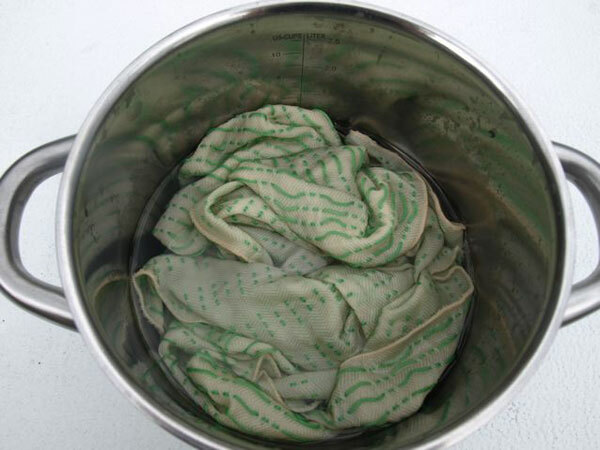 Pour dissolved dye through a small strainer into a non-reactive dyepot (stainless steel or enamel) with enough cold water to float your gathered fabric freely. Add wetted out and gathered fabric. Heat the bath VERY slowly to about 175°F. this should take at least one hour. The slow rise of temperature assures the best reds from the madder. Stir occasionally during the dyeing. Allow the cloth to cool in the bath. You can even leave it overnight. The cloth is gathered and dyed. Remove fabric and rinse well. The gathering threads can now be removed but they will come out most easily if the cloth is allowed to dry first. Wash the opened cloth thoroughly in hot soapy water to finish. The Textured Stripe Scarf completed. Although I love the look of the deep red/orange on the white ground, I wanted to “tone down” the contrast some. 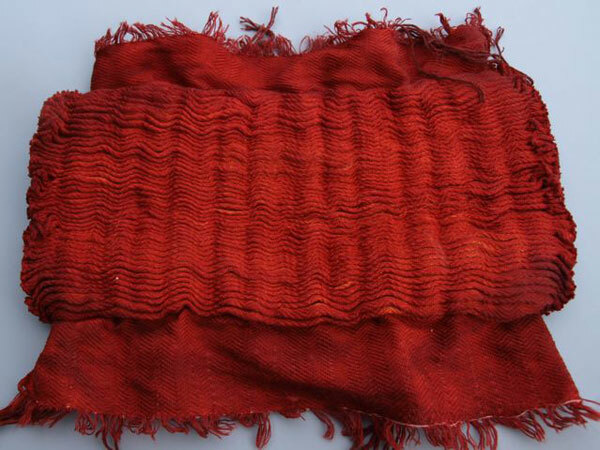 After all the gathering threads were removed I re-wet the cloth and dyed it a second time – very briefly in a tannin based dye. I used a 4% solution of Quebracho Black (about 1 tsp of extract) but you could get similar results with black walnut, or even black tea. 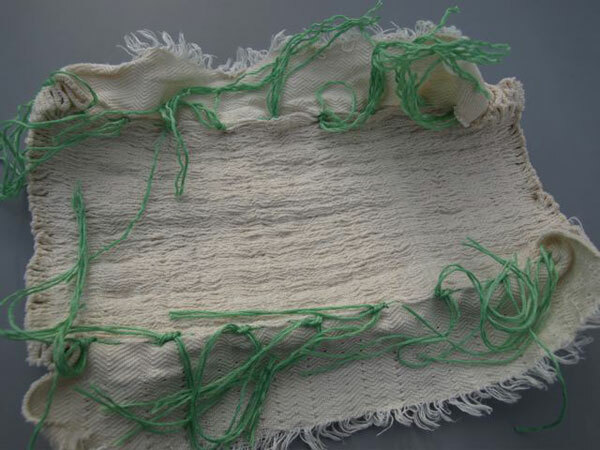 There is no need to re-mordant the cloth. The cloth is sipped into the dyebath and moved around to insure an even dye. To finish, the cloth is washed once again and dried. Then the edges are hemmed. Finished Textured Stripe Scarf showing different patterns on both sides of the cloth. 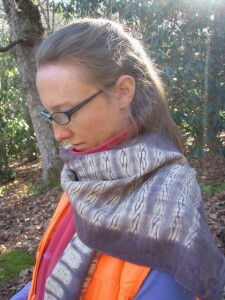 This post is written by shibori artist and author, Catharine Ellis. Catharine created woven shibori, a process of weaving and resist. She teaches workshops on this techniques, or you can learn from her book, Woven Shibori (Interweave, 2005).